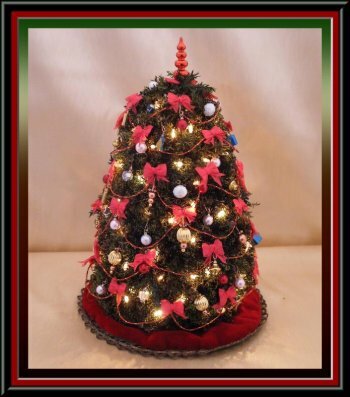 Home :: Holiday Decorations :: Dollhouse lighted Christmas Tree 6"
Dollhouse lighted Christmas Tree 6"
This beautiful tree is very special. Made of natural preserved Princess Pine and adorned with almost 100 tiny lights that work with 12 volt system. Features handmade ornaments, silk garland and silk bows. Tree skirt is included.